First we will get located. The older view looks east on King Street from a trestle on Fourth Avenue. March 24,1907 is scribbled at the bottom of the original print, one of the many Seattle Gas Company scenes pasted on the black pages of a photo album, and shared with me long ago by friend Michael Maslan and his namesake “Historic photographs, Postcards and Ephemera” shop. 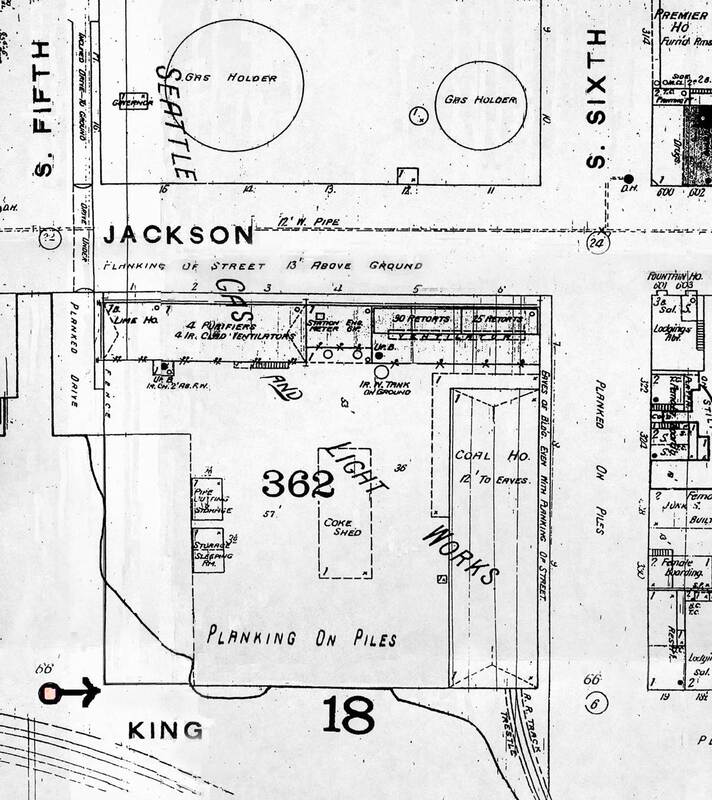 1893 Sandborn real estate map showing block bounded by then 5th and 6th avenues (soon renamed respectively 4th and 5th avenues) and Jackson and King Streets, the site of the Seattle Gas Company. 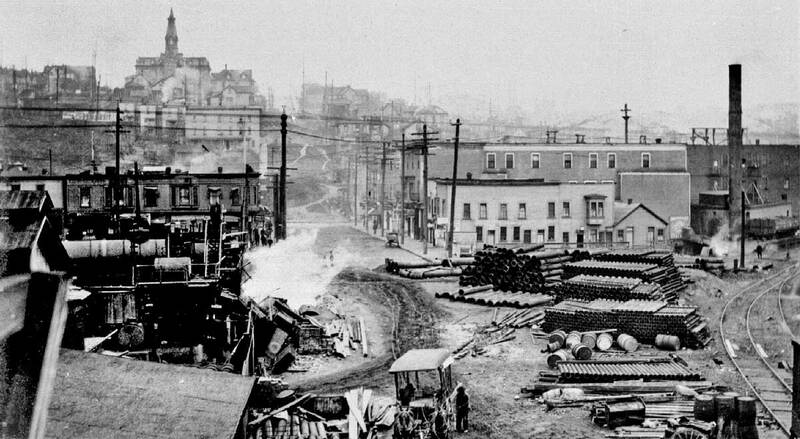 The Seattle Gas Company began its distribution on New Year’s Eve 1873, illuminating 42 residences and a few intersections. The then still young city government had to pay a stiff sum for those streetlights. The gas was delivered through bored fir logs imported from Olympia. As noted, the Seattle plant, where the gas was manufactured from coal and stored in a wooden tank, was on Jackson Street beside 5th Avenue. The railroad tunnel completed beneath the city in 1905 made these reclaimed tidelands south of Jackson that were closest to the business district too valuable for mere manufacturing. Soon after this view was recorded, the gas plant, showing in part here, was razed for construction of the Union Pacific Station. The album from which this view was copied includes many more on the 1906-07 construction of the alternative gas works in Wallingford – now Gas Works Park. Everything in the background of this scene was radically altered in 1909 with the Jackson Street regrade. Among the structures razed was the Holy Names Academy on Seventh Avenue, which had opened to girl students only in 1884. Its doomed spire dominates the skyline, top left. During this regrade the horizon line here – the old ridge between First and Beacon Hills – was lowered as much as 109 feet. The neighborhood developed in this scraped land is variously called China Town and the International District – often both and sometimes contentiously. “The pit” left after the gas plant and its planking were removed seen from the Great Northern Depot tower in 1908. Courtesy Lawton Gowey. Most of the dirt scraped away during the regrade was used to fill in more of the tidelands south of here. The wagon, the barrels and the stacks of pipes in the foreground are supported by timber scaffolding, over which a thin layer of dirt was spread. Again, this is shown on the map where the caption reading “Planking On Piles” refers to the rectangular area that includes most of the buildings of the Gas Plant. This rectangle construction overlays an irregular line, which indicates an average for how high the tides reached or flooded onto the reclaimed portion of “Gas Cove” in 1893. By 1907 more of the cove had been reclaimed and, as the principal photo shows, the “Planking on Piles” has by then also extended further south. 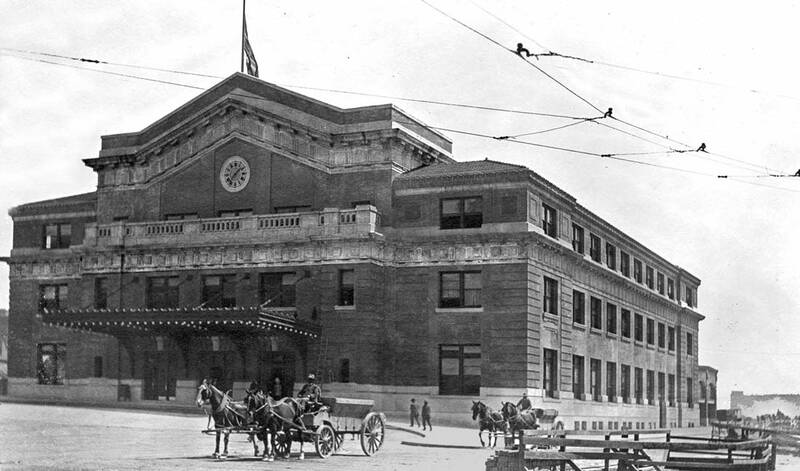 With the 1907 abandonment and razing of the gas plant this elaborate timber-supported construction was torn away leaving a pit to be developed both for the Union Station and its yards, and more recently for Vulcan. The picture of this hole included above was photographed from the tower of the Great Northern Railroad’s own Union Depot on December 20, 1908. 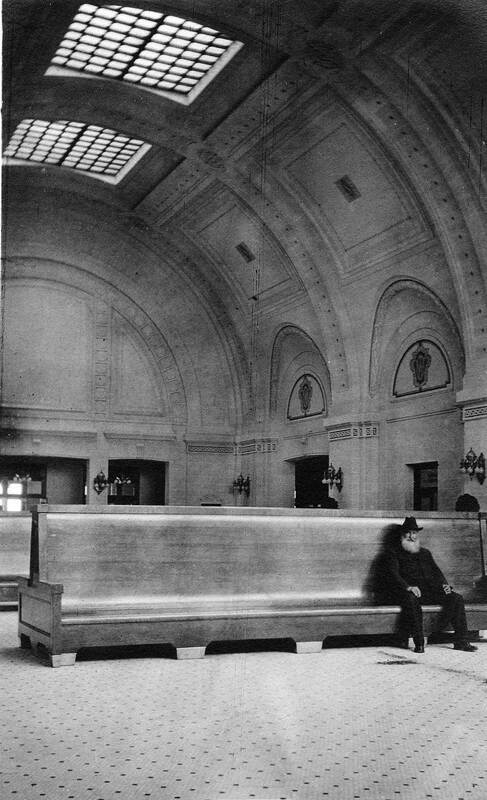 An early interior of the Union Pacific Depot. Courtesy John Cooper.